El Hub and I are taking a trip out to Hawaii next month (May 15-25) to visit our family. I’m not sure if you recall, but El Hub’s mother was diagnosed with breast cancer last fall, right around the time of Breast Cancer Awareness Month. I always knew your thoughts and prayers were with us (and thank you), but I just set my heart and mind on maintaining a positive attitude on the blog here because I felt I needed to focus on something good. After twin mastectomies (staggered, each one at different times) and three months of brutal chemo therapy, Mom has been issued a clean bill of health. Which brings me back to the purpose of this post. I could really use your help while I’m away, and there may be a way in it for you to have some fun. Because I may not have time to post three times/day while we’re there, I’m looking for guest bloggers to do product reviews, product shootouts (comparisons, i.e. Stila Lash Visor vs. MAC Splashproof mascara), makeup looks, tutorials, how tos/tips articles or videos to appear on the blog. Why would you want to guest blog? Because you’d be doing me a favor. I’ll feel better knowing that the blog is in good hands and that interesting posts are going up on a regular basis if I end up being unable to post as much as I usually do. It’s FREE advertising. If you have a blog, other website or a business you’d like to promote, you’re looking for ways to get yourself out there. Guest blogging can really help, especially if you’re just starting out. Get yourself out there in front of another 7,000-8,000 readers/day, and definitely feel free to include links back to your own site! Try before you buy. Have you thought about starting a blog but weren’t sure if you had anything worthwhile to say? LOL! Story of my life. Try a guest entry here (I won’t bite!) to see if it’s something you might like to do long term with a blog of your own. If you’re interested, shoot me an email at karen@makeupandbeautyblog.com (or use my contact form) with an overview of your idea. We’ll brainstorm. No, it does NOT have to be some hugely involved, time-consuming project (seriously, I know you’re busy too). Even just a single product review of something you got from Sephora last week and liked more than you thought you would. All I ask is that it be original and not something you’ve already published someplace else. P.S. I am ALWAYS looking for guest bloggers, not just for my trip next month, so contact me if it sounds like something you’d like to try. P.P.S. 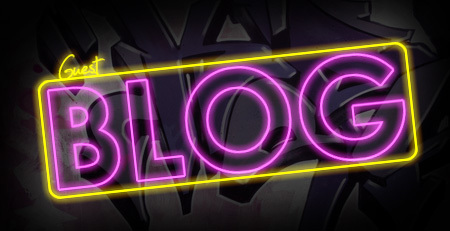 Every so often, I’ll choose a random guest blogger to feature with a custom illustration up in the header of the blog. You know how much I like Photoshop, right? Picture your name in lights, LOL! If you’re looking for attention for your blog or website, the header gets 18,000-20,000 pageviews/day. There are 41 comments on this post. Leave yours. I am so happy to hear that your MIL is doing great. That’s awesome news. I just found out Ally’s mum has breast cancer on Friday, so I feel for you. I’m glad you Mother-in-Law is doing well. My Grandma had a double mastectomy when she was diagnosed with it before I was born. She couldn’t have breast reconstruction as she has Lupus (even back then). One of her sisters got breast cancer a few months after she had breast reconstruction and died. She has silicone breasts that she puts in her bra everyday. She’s had them for so long our family jokingly calls them her “removable breasts” and if she ever wanted breast augmentation, all she would have to do is order her breasts in a bigger size! It’s rather funny actually. My grammy is one tough cookie, I tell ya. I wish I could blog for you but knowing me, I’d blog none-stop about Zena. Also, I lack a car (my dad refuses to let me drive his baby) and a digi camera as my dad killed it on a kayaking trip. I hope y’all have fun in Hawaii! I’m living vicariously through you as it’s been thundering and raining where I live since Saturday (ugh). I’m glad to hear that your mother-in-law is doing well. Ahh I’m glad your MIL is doing well. Also sent you an email about guest blogging ! Thank you — we’re happy that she’s doing better, too! Thats fantastic news about your MIL – I’m so pleased for you all! I quite like the idea of guest blogging, but I don’t think I’ve ever done any blogging on makeup before! I’m going to have a think and see if I can come up with something interesting and if I can before you go away, I’ll drop you a line! Thank you… 🙂 Yes, please, if you do come up with anything I’d love to hear about it! 🙂 Thank you for the offer. Great news about your MIL. My mother is a breast cancer survivor, so I know where you’re coming from! Have a good time in Hawaii–you have lots to celebrate! I’m glad to hear your mom is doing okay. When was she diagnosed? Have a good week at work! What do you do? And do you like your job? Thanks and thanks. I look forward to reading your e-mail! I’m so glad to hear the good news! I can’t say I know what she went through but I’m sure it’s a huge relief for her & I wish her health and happiness for years to come. Thank you… I hope every day for the same things. That’s such good news, Karen. 🙂 Take care in Hawaii, we’ll miss you ’till you return! Thanks, hon. I’m glad to be able to share good news with you guys. Hope you’re having a nice Monday so far! Glad the chemo and treatments have worked for your MIL! Definitely sending some positive vibes to you and yours! I’m glad your MIL is doing well. I remember when you first shared the news. I’m sure you are looking forward to your trip! I know how it is when a family member becomes very ill and the feeling when everthings turns right again. Glad to hear that your MIL is doing better now. Have a wonderful trip (hey, it’s still Hawaii 😉 ) I would love to be a guest blogger, but it doesn’t make sense to blog from another continent. But never say no, I’ll give it a try. YAY i am so relieved to hear your mommy in law is doing great ! i hope you guys have a great time in hawaii! I’m so glad to hear El-Hub’s mom is going to be fine. Kudos to you for managing to function so well under so much pressure and worry. If I think of any blogging ideas, then I will pass them along. I’m soo thrilled that your mom-in-law is doing well and that you and El Hub will get to spend some much needed time together very soon! Thank you! 🙂 It’s been a minute — how have you been? Guest blogging sounds to good to be true. Wonder if is too late now?